A fire pit is a great way to enhance an outdoor space - and it can be an exciting DIY project too! 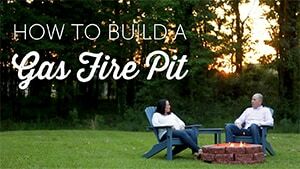 This how-to guide simplifies the building process for a DIY gas fire pit made of stacked paver stones. These landscaping stones are inexpensive and can be found at a local hardware store. Combine them with our fire pit burner kit and finish it off with dazzling fire glass or traditional lava rock! It is worth noting that a dry stacked fire pit is considered temporary. To build a more permanent fire pit, we recommend starting off with a Ready to Finish Fire Pit. The galvanized structural steel enclosure is made with a tubing frame, non-combustible hardboard shell and arrives ready to connect. All you need to do is finish with masonry stones to match the decor. Important: Making gas connections is not a “Do It Yourself” project. All gas connections should be made by a qualified technician and in accordance with local codes and ordinances. A qualified technician will be able to diagnose any problems and make corrections before the install to achieve the best results. When compared to propane, a natural gas fire pit costs less to operate but costs more to set up. When installing the gas line it is important to remember that the length, width, and pressure of the gas line can affect the flame height. Propane is more energy efficient than natural gas and hooking up a portable propane tank is easier than installing a gas line. Propane also allows for easy adjustment of gas pressure which controls flame strength. Getting the biggest flame possible may be the goal but we strongly recommend choosing a fire pit ring that is 12" smaller than the inside diameter of the fire pit. For example, if the inside diameter is 42" then a 30" fire pit ring will be needed. This allows a safe distance between the flame and the edge of the fire pit. It also helps create an aesthetically pleasing look. Plan to allow proper ventilation. Vents placed on opposite sides are REQUIRED to prevent unburned gas from collecting and causing an explosion. Propane is heavier than air so vents should be placed closer to the bottom to allow any unburned gas to escape. Natural gas is lighter than air, so vents should be placed closer to the top. Pick the spot where the fire pit is to be located. Level ground is best and will require less work to stack the stones even. Lay a ring of bricks and set the pan in to make sure the spacing is correct. Mark the outside of the ring with a shovel so that you can dig the foundation. Dig deep enough for one stone plus an inch of sand. Note: The time to run the gas line is NOW! Level the bottom of the hole with about an inch deep of sand. Dry stack the stones. Stop after each layer to make sure all of the stones are level. If stones are not level, use a rubber mallet to gently tap it level. Alternate each layer so that the stones overlap the previous layer. Add a layer of pea gravel to the bottom of the fire pit to help it drain. Note: Plan to leave openings on both sides for venting. This can be done by leaving a single stone out on each side on the first level. The control valve will need to be mounted into the fire pit wall. A paver block bracket is the easiest option since it takes the place of one stone and will easily adjust to fit the size of the stone. Other methods of mounting the control valve include drilling a hole into the stone or chipping a stop to allow enough room for the valve to fit. Now is the time to make the gas connections and install the burner and burner pan. Have a qualified technician make all connections and test them before continuing. Once all connections have been tested, place the final layer of stones around the fire pit. Fill the burner pan with no more than 2 to 3 inches of fire glass or lava rock. For a more traditional look, we recommend lava rock and gas logs. If a more modern look is wanted, go with fire glass. We have a dazzling assortment of sizes, shapes, and colors. To calculate how much fire glass is needed, use our Fire Glass Calculator. Once the connections are made and the pit is filled, it is now time for you enjoy your new fire pit!